Buying a house, in present times, is an expensive proposition and yet it is a dream that everyone wants to fulfil in their lifetime. Usually, people do not have enough savings to purchase a home outright but since they see the value of the home going up in the coming times they find it to be a safe investment. Many home buyers have the capacity to make a down payment of a smaller amount but they still need a big part of the amount to be funded. SBI Home loans are the largest home loan lenders in India. They are trustworthy and transparent. SBI offers a wide range of product within home loans with low processing fees with no hidden charges and competitive rate of interest. 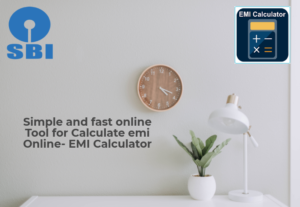 SBI home loan EMI calculator and SBI home loan eligibility calculator help you calculate your EMI from the comfort of your space. Winner of the “Best Home Loan Provider “at the CNBZ Awaaz Real Estate Awards 2016, SBI home loans are the largest home loan lenders in India. They have helped lakhs of people to make their dream of owning a home come true. SBI home loans are the most trustworthy in India with no hidden cost. They offer the most transparent loans and hold themselves high in integrity and excellence. SBI home loans offer a wide product range. The SBI housing loan EMI calculator provides the interest calculation on a daily reducing balance. They offer a very low-interest rate with low processing fees and no hidden costs. The loan also comes with the advantage of no pre-payment penalty. Equated Monthly Installments or EMIs is the amount spread equally every month that the borrower pays to SBI bank to repay your principal and interest. The loan eligibility calculator SBI can be used to calculate the repayment schedule of the home loan. It helps in getting an estimate of the monthly EMI on basis of the loan amount, tenure and interest rate. The SBI home loan calculator 2018 enables you to choose the best plan based on your eligibility. SBI offers a home loan for a maximum of 30 years at an interest rate of 8.65% with an EMI of Rs.780 per lakh. As the tenure increases the EMI decreases. The EMI consists of both principal amount and the interest. The proportion of these two keeps changing every EMI. Gradually the principal repayment increases and the interest reduces. •Loan Amount – The amount of money borrowed by the borrower from SBI home loan. The higher the loan amount the higher the instalment. The minimum amount of loan that SBI offers is Rs. 15 lakh and the maximum being Rs. 10 crores. •Interest Rate – The rate of interest is the amount to be repaid by the borrower over and above the principal amount. A higher interest rate increases the housing loan EMI thus leading to an increase in the total cost of the loan. Currently, SBI home loan interest rate starts at 8.65%. •Loan Tenure – The period in months in which the borrower can repay the loan spread in EMI is referred as the loan tenure. The longer the tenure, the lower is the EMI on the home loan. The tenure is determined by the borrower’s age at the time of sanction of the loan and the retirement age. The maximum tenure of loan offered by SBI is 30 years. What is The Purpose SBI Home Loan? SBI home loan is taken to purchase, construct a home or renovate your existing home. Who is Eligible for SBI Home Loan? SBI home loans are available for both salaried and self-employed people. There are special rates for women borrowers. The borrower should be between the age of 18 and 70 years. What security to do I have to give to avail SBI home loan? The security is the property you are planning to purchase, renovate or construct. How much maximum loan value can I receive? What is the minimum and maximum loan tenure for SBI home loan? The loan tenure can range from 5 to 30 years. What is the minimum and maximum interest rate for SBI home loan? The minimum and maximum interest rates in the range of 8.65% to 9.05%. How Much is The Lowest EMI? How Much is The Processing Fees? Does SBI Bank Offers Any Special Scheme Under Home Loan? EMI – An equated monthly installment (EMI) is an amount fixed by a borrower to a lender to be paid on a specific date each month. These include both interest and principal over a specified number of years till the full loan is paid. Online Calculator – It is calculated directly from the computers numerical keyboard or mouse. Clicking on standard calculator displays the online mathematical calculator. This is available online free of cost. Repayment – It is the payback money by the borrower to the lender. It includes part of principal amount and part of interest amount and is made periodically or in full. Tenure – The duration for which the loan amount is sanctioned is known as the tenure of the loan. It may vary from 1-20 years depending on the type of loan and the EMI payment capacity of the borrower. Banks – Banks are financial institution licensed to deal with money and its substitutes by accepting time and demand deposits, making loans, and investing in securities. They generate profits from the interest rates charge and paid. NBFCs – These are Non Banking Financial Company (NBFC) registered under the Companies Act, 1956 of India. Like banks, these are also engaged in the business of loans and advances, acquisition of shares, stock, bonds, hire-purchase insurance business. RBI – Reserve Bank of India is India’s central banking institution. It controls the monetary policy of the Indian rupee. It commenced its operations on 1 April 1935 in accordance with the Reserve Bank of India Act, 1934. PMAY – Pradhan Mantri Awas Yojana was launched in June 2015 with an aim to provide affordable housing in urban poor and to address the gaps in the rural housing program and strengthen the government’s commitment to providing ‘Housing for All’ by 2022. In this scheme the government will provide an interest subsidy of 6.5% on housing loans availed by the beneficiaries for a period of 20 years under credit link subsidy scheme (CLSS) from the start of a loan. The houses under Pradhan Mantri Awas Yojana would be constructed through a technology that is eco-friendly, while allotting ground floors in any housing scheme under PMAY, preference will be given to differently abled and older persons. MCLR – Marginal Cost of Fund based Lending Rate (MCLR) is the internal benchmark rate used by banks to fix the interest rate on floating rate loans. It refers to the minimum rate of interest of a bank below which it cannot lend, except in some cases permitted by RBI. It is an internal reference rate or benchmark for the bank. Since 1st April 2016, all Indian banks are required to benchmark and price their loans to MCLR. The guidelines for MCLR has been set by RBI that all banks are required to follow.